Single Baseball Display Case | Perfect Cases, Inc. The Single Baseball Display Case by Perfect Cases offers a beautiful way to showcase your autographed baseball. This baseball case is made of Real Glass with crystal clear clarity. 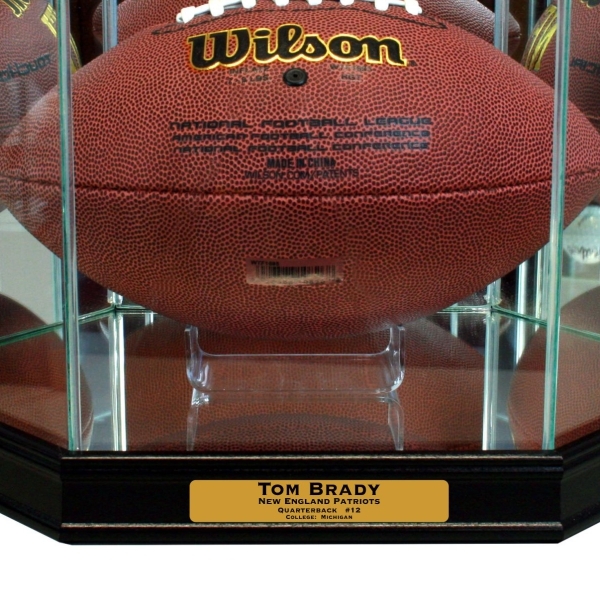 Baseball collectors will love clarity and protection that this display case offers. Autographs will not fade in our baseball case. Single Baseball display case. It comes standard with mirror on the back and bottom panels. We uses high quality glass with crystal clear clarity. 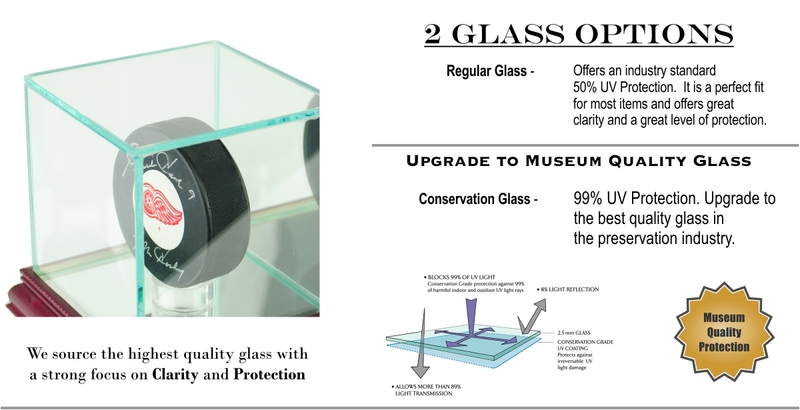 Our Regular Glass offers 50% UV Protection. You can now upgrade this baseball case to include 99% UV Protection. We offer 5 moulding choices and several suede color options for the bottom. 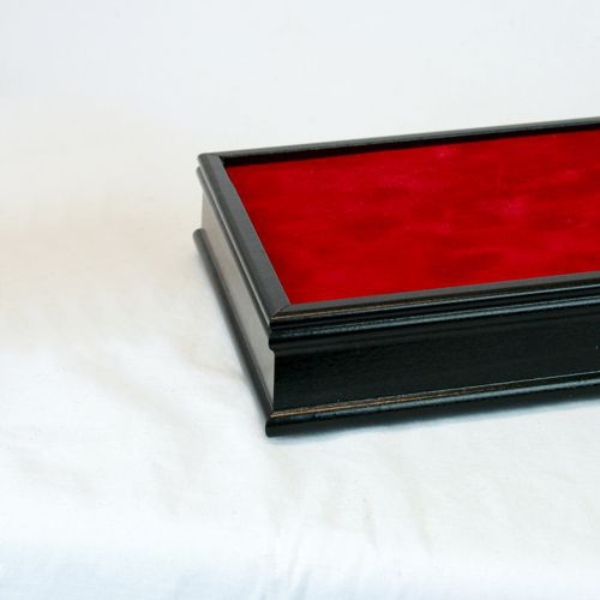 Add engraving to personalize this display case. Our table top display cases are designed for the case to lift off of the base. This also includes soft felt tabs on bottom to prevent damaging any furniture. The glass portion of the baseball display case lifts off of the base. This baseball case comes with a clear acrylic holder. One of the best reasons to choose glass over acrylic is how easy it is to clean. Simply use any Glass Cleaner preferably with a lintless cloth. Spray on the cloth first, then apply to the glass. Touch the corners when handling to avoid fingerprints. Very nicely constructed. Quality materials used throughout. I'd by another. I was excited about the quality of the case, the beautiful museum quality cover and the engraving was flawless. Delivery was on time and the packing of the case was perfect. Anyone wanting a display case can buy a cheaper case but from my experience is you have something of great personal value one that you will display with pride, I'd recommend Perfect Cases. Ordering the case was very easy. The craftsmanship of the case is first class. I received the order in a very timely manner. I would definitely use them again and recommend them to friends. Excellent customer service, follow thru, delivery and quality product. Smooth process all the way. You won't be disappointed. Highly recommended!!! Product received in excellent condition. Customer service was top notch. I would highly recommend. I am very pleased with the single baseball display case. It arrived well packaged, intact and as ordered. The custom nameplate is correctly printed and looks great. Case is perfect. Elegant look & great quality. The personalization options are great. I definitely recommend these cases. I've bought several cases from your company. They are always packaged perfect and the qaulity is out standing!!! You Have a life long customer. I have Recommended yor company to my friends. Thank you for Taking pride in you product.